Stay productive without taking up too much space with the second-generation Lenovo ThinkCentre M715q Tiny Desktop Computer. It features a compact design that packs a 3.2 GHz AMD Ryzen 5 PRO 2400GE quad-core processor and 8GB of RAM, so you can type and browse the web. While running demanding tasks, the processor's four cores can operate at speeds of up to 3.8 GHz. The M715q has an integrated AMD Radeon RX Vega 11 Graphics chipset, which delivers detailed visuals to your DisplayPort-equipped monitor. For storage, a 256GB PCIe NVMe SSD is onboard, and Windows 10 Professional (64-bit) is preinstalled on this drive. Other notable connections include two DisplayPort outputs, three USB 3.1 Gen-1 Type-A ports, and three USB 2.0 Type-A ports. Accessing the internet can be accomplished wired or wirelessly via onboard Gigabit Ethernet or Wi-Fi 5 (802.11ac). There's also Bluetooth 4.2 for wireless access to headsets and speakers. 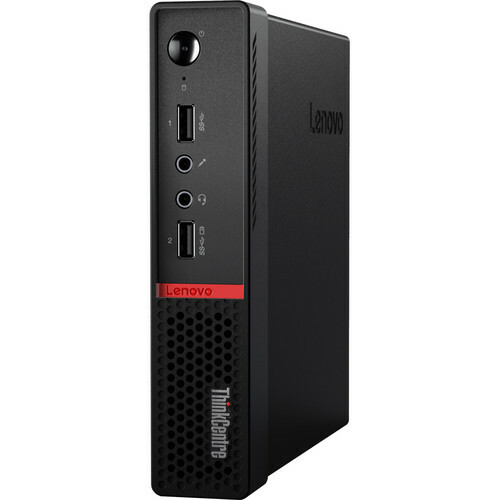 Additionally, Lenovo includes a USB-wired keyboard and mouse for easy typing and navigation. There is also a floor stand so you can place the ThinkCentre M715q vertically. Box Dimensions (LxWxH) 19.7 x 11.2 x 6.9"